I wrote the other day about my love for lemons, their brightness lifts many a dish; both sweet and savoury, they are one of my kitchen essentials. Here I used lemon to add a touch of zing to chicken, served as a bowl. 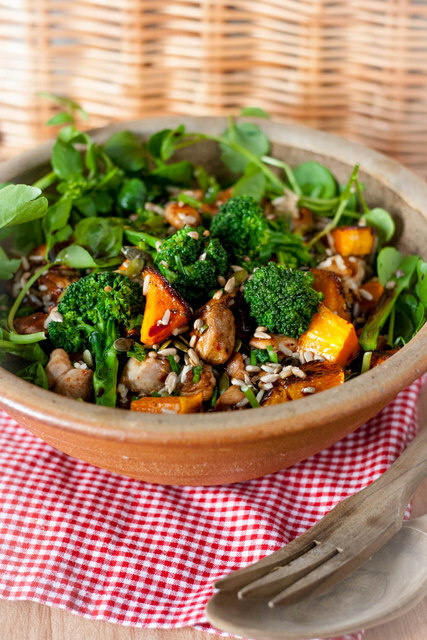 We eat bowls fairly often – not literally crunching the crockery – but a bowl meal – vegetables, grains and protein all served as one complete meal in a bowl. Bowls are infinitely adaptable; serve warm, hot or cold, they cater for all tastes, if you want to be healthier you can add far more vegetables, if you need comforting, then add in some extra carbs. I cook with my next bowl in mind – steam extra grains, marinade some extra protein, buy an extra bag of salad leaves – all are perfect for a bowl. 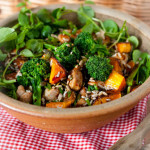 For this bowl I layered peppery crunch watercress, gently steamed tenderstem broccoli, a cup of leftover steamed brown rice and some roasted butternut squash from the fridge. I cooked some chicken – the only really hands on part of the process – it had been prepped in advance – cut up and frozen in its marinade; a useful trick to maximise flavour. The hot chicken wilted some of the leaves, and to finish off I scattered some seeds over for extra flavour and texture. Delicious! If you try this Recipe: Lemon Chicken Bowl please tag #FussFreeFlavours on Instagram or Twitter. It is amazing for me when for me when you make one of my recipes and I really do love to see them. You can also share it on my Facebook page. Please pin this recipe to Pinterest too! Thanks for reading Fuss Free Flavours! Whisk the lemon juice, soy sauce and oil together with a fork and pour over the chicken pieces. Leave to marinade for an hour or so, or pack into a plastic box, or jam jar and freeze. To cook simply fry the chicken in a splash of oil until cooked through. Pour over the remains of the marinade at the end of the cooking and let it simmer and thicken for a few minutes.